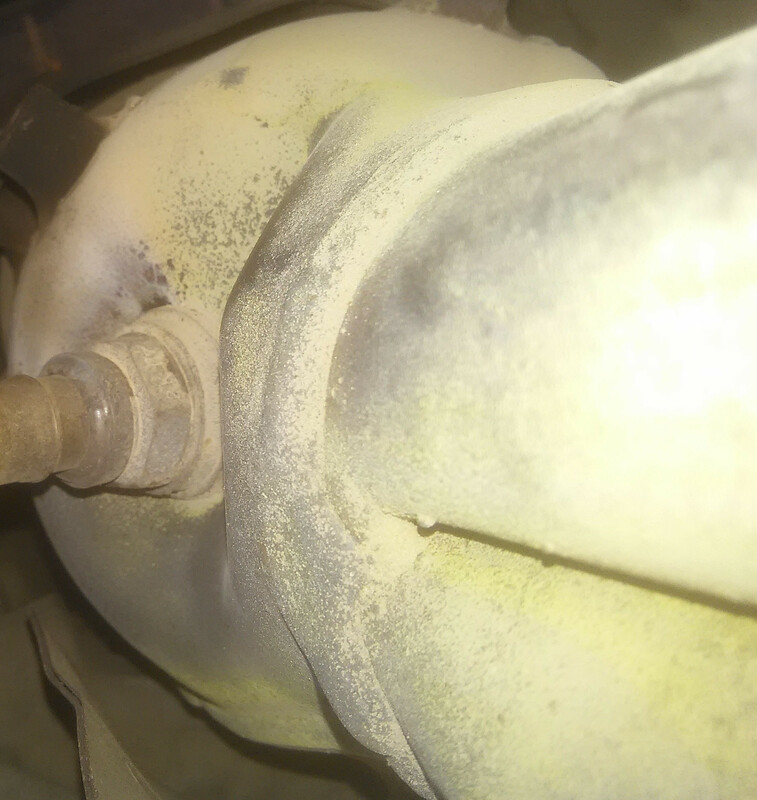 What is this yellow powder on my exhaust manifold? There seems to be another layer of something under the powder which got wiped away at the same time, and the yellow powder itself seems grainy. I also verified ( as well as I could ) that there is only one exhaust leak which is from the base of the O2 sensor. I stuck a funnel in a length of hose and had my wife block the exhaust with a rag and this was the only place I heard anything, and the change in sound was quite pronounced when she blocked the exhaust. Dust, that got "burned" by the hot exhaust manifold and transformed into some yellow-looking substance. If your engine was running / exhaust manifold hot; the yellow is then zinc oxide. It would result from a galvanized steel manifold which has naturally oxidized. At room temperature the ZnO is white , I forget the temperature where it turns yellow. Not the answer you're looking for? Browse other questions tagged exhaust exhaust-manifold or ask your own question. What is this exhaust type thing? Broken Exhaust Manifold Stud - How to remove? What options do I have for installing an O2 sensor in a cast iron exhaust manifold? How to retighten exhaust manifold nuts?